Christmas Eve is a fine occasion to consider how an obscure essay published more than 120 years ago in a combative New York City newspaper became the most memorable editorial in American journalism. Its trajectory from obscurity is remarkable. The Sun in reply was reassuring. The editorial was published not at Christmas but in September 1897, in the third of three columns of editorials in the Sun–a newspaper that relished the rough and tumble of late 19th century American journalism. Indeed, the trade journal Fourth Estate observed in 1897 that the Sun was never happy unless it was on the attack. Given such tendencies, I wrote, “the delicate charm of ‘Is There A Santa Claus?’ was decidedly out of place” in the columns of the Sun. “Since its original publication, the Sun has refrained from reprinting the article on Santa Claus which appeared several years ago, but this year requests for its reproduction have been so numerous that we yield. In 1924, the newspaper’s then-owner, Frank Munsey, ordered “Is There A Santa Claus?” to appear as the lead editorial on Christmas Eve. In the years that followed, until the newspaper folded in 1950, “Is There A Santa Claus?” was the lead editorial in the Sun on December 23 or 24. It remains a favorite, 113 years on. The editorial is a cheering, reaffirming story, one without villains or sinister elements. It represents a connection to distant time: It is reassuring, somehow, to know that what was appealing in 1897 remains appealing today. It offers a reminder to adults about Christmases past, and the time when they, too, were believers. 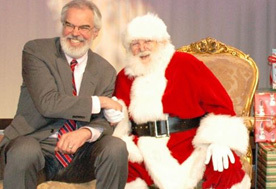 It has been a way for generations of parents to address the skepticism of their children about Santa Claus. They can point to the editorial and its timeless answer to an inevitable question–and not have to fib much about Santa’s existence. Interestingly, the essay was written by a veteran and childless journalist named Francis P. Church whose authorship wasn’t widely known until soon after his death in April 1906. The Sun revealed that Church had written the editorial in what was an eloquent, posthumous tribute.